“Tauck Tours is a major upmarket American holiday company owned and operated by the same family for over 90 years. Based in Connecticut, it enjoys a loyal clientele with many repeat customers. It has had a UK operation for some years. We signed up for the Tauck “Small Ship Cruise” to Venice and the Dalmatian Coast from 5-14 June. We took advantage of Tauck’s “gift of time” offered to repeat customers. This allowed us to arrive a day early and enjoy the hotel courtesy of the holiday company. When the tour began the following day, we had already spent a full day in Venice and were acclimatised and rested. The tour began at the historic Danielli Hotel in Venice, minutes from St Mark’s Square. Tauck uses only 5-star hotels and obtains the best rooms with the finest views for its guests. We had an outlook on the Grand Canal from our bedroom. The land portion of the tour included an excellent guided tour of the Doge’s Palace and St Mark’s Cathedral, as well as an inclusive gondola ride. Ample time was allowed for us to explore on our own. Aside from breakfast at the hotel and a welcome cocktail reception and banquet, meals were not included in Venice. We appreciated the space that gave us time to explore and enjoy the city on our own. Our Tauck tour director was always available for advice and guidance. The tour then took us on private boat excursions to the islands of Murano (where we had a private glass-blowing demonstration) and Burano, with ample time to shop and explore independently. 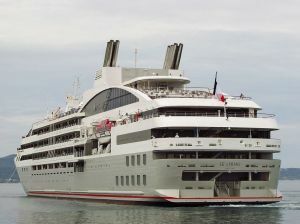 Next we boarded our small cruise ship, Le Lyrial, operated by the French company Ponant. This vessel was rather luxurious. It carried a maximum of 230 passengers, about half of whom were on our tour, the rest mostly French travellers. Cuisine was excellent, and amenities were adequate. A swimming pool, fitness centre, theatre and lectures and entertainment were available, and excursions could be booked from the tour desk. Berlitz/Douglas Ward rates the 10,000-ton ship at 1542 against the slightly larger Silver Wind at 1658 and smaller Sea Dream series at 1758. Members of our tour did not need to book any shore excursions. All were included in our package, consisting of excellent Tauck-contracted guides who spoke English well and had a good sense of humour. 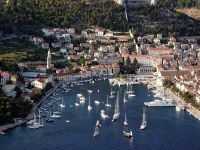 We toured lovely sites in Croatia and Montenegro, including Korcula, Krka National Park, Split (and Diocletian’s Palace), Dubrovnik, the fashionable island of Hvar, and the beautiful Bay of Kotor and Kotorska in Montenegro. We were also treated to a wine tasting and a sampling of olive oil from the vineyards and groves on the island of Hvar. Tauck tours are “all-inclusive.” That means all gratuities are included, even those for the tour director, all guides, and all transfers to and from the airport, all tours, baggage handling, etc. Aboard ship, unlimited alcoholic beverages, minibar, and wi-fi were included. Most of Tauck’s clients were American, but there was a healthy sprinkling of Canadians, Australians and a few South Americans. All were well-travelled, friendly, and considerate. The journey was a perfect blend of scenery, history, and ambiance, and, for us, was of a perfect length. Highly recommended by this American traveller.